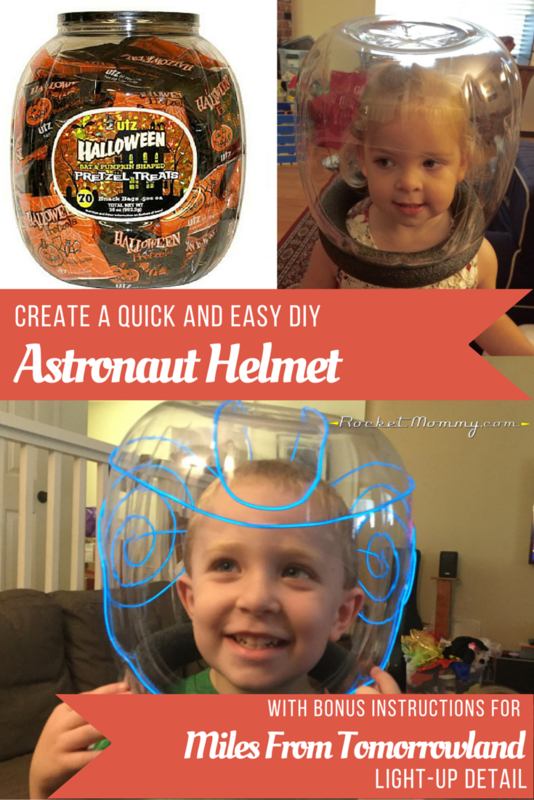 Today I’m going to show you the easiest, cheapest way to add a nifty astronaut bubble helmet to your dress-up collection or your Halloween costume. 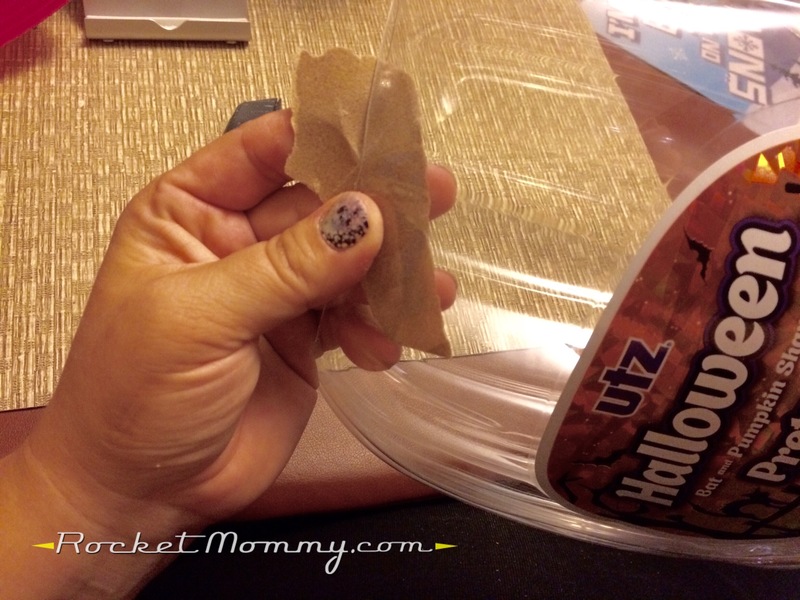 This is a craft that would be fun to make any time of year, but you’ll only find the best container to use for it right before Halloween. So…that gives you about two weeks to put these together for your little budding astronauts! 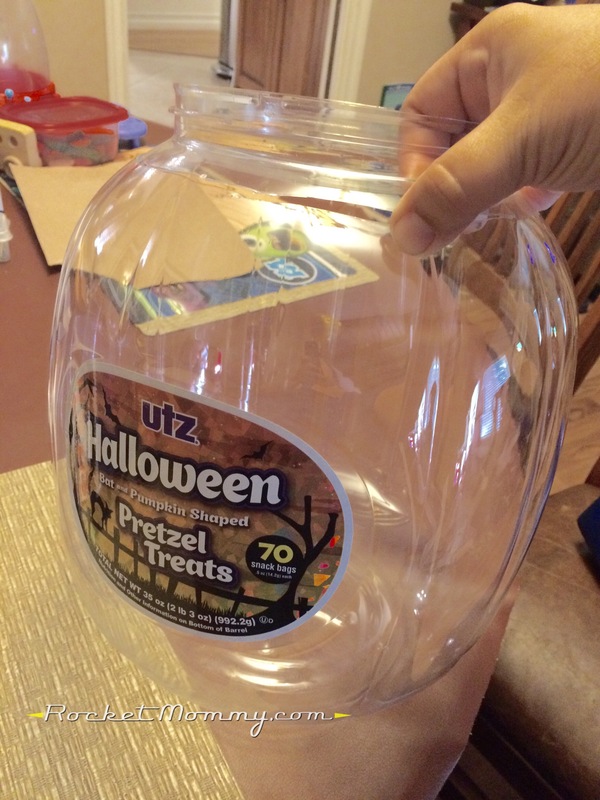 First of all, you need to go out and buy one of these massive containers of Utz Halloween pretzels. I bought mine at Costco. Sam’s Club has the same pretzel treats, but for some reason the pumpkin that they’re stored in is red, and that won’t work for this. You want the ones that come in the big clear plastic pumpkin. Then take the utility knife and start a hole in the indented area where the label is. You don’t have to remove the label; you’re going to cut that whole piece out. Once you have a hole, use a pair of heavy duty scissors to cut around the edge of that indentation. It’s a good idea to switch to scissors here because it will help you keep the edge clean and smooth – you won’t have as much control with the utility knife on a curved surface. You’ve got the basic shape of your helmet cut out now. 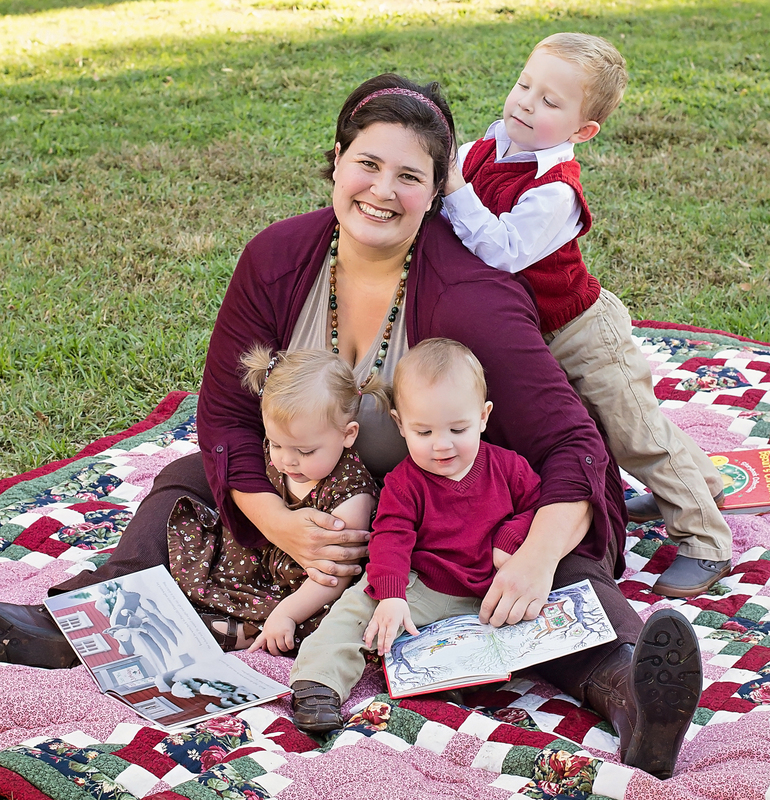 Your kiddo will stick their head in the big hole at the top (which will now be the bottom), and the label cutout will allow them to see and breathe and be comfortable. Take a bit of sandpaper and sand down all the edges you cut, just to make doubly sure there aren’t any sharp pieces of plastic that will scrape them when they play with it. 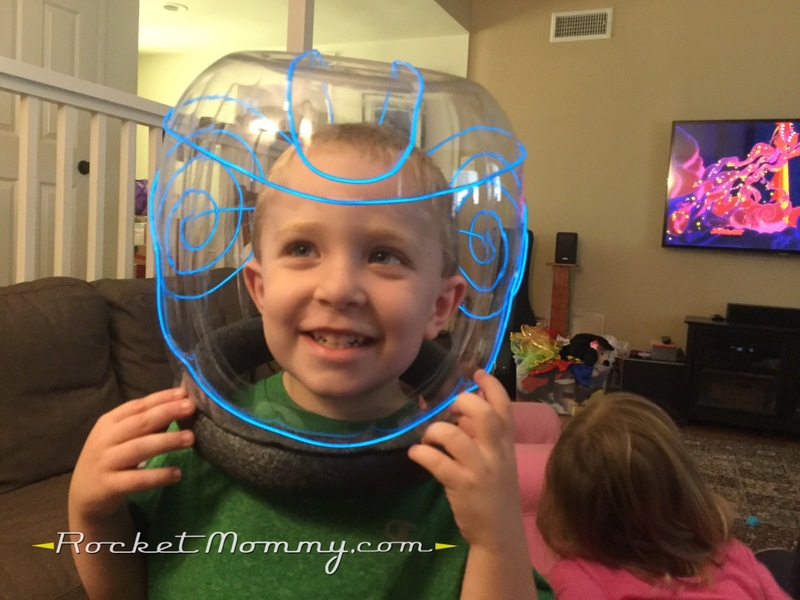 Try it on your little astronaut and see if they can fit their head comfortably through the big hole. 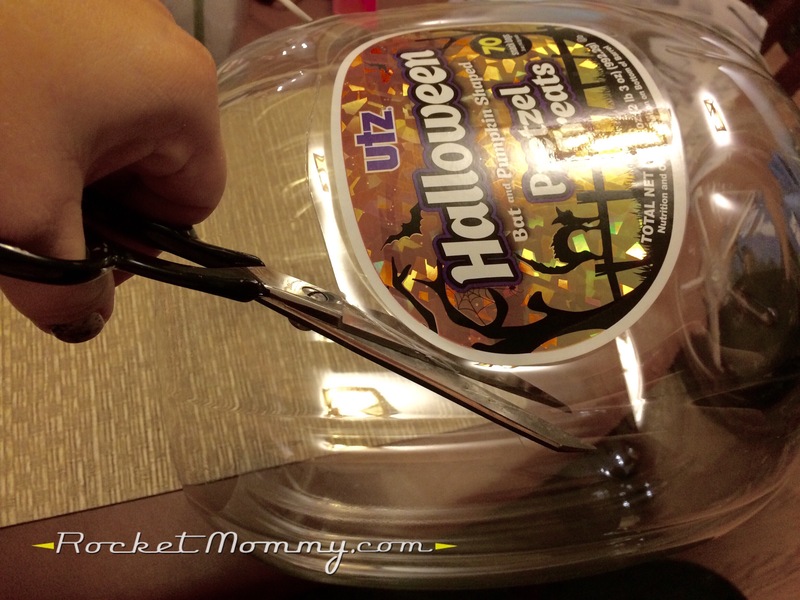 If it’s a tight squeeze, get out your heavy-duty scissors again and make that opening wider. You’d be surprised how little you’ll need to take off to get it to fit, so go in 1/4″ or so increments. To cover that cut edge at the bottom, I used a piece of foam pipe insulation that I picked up at Home Depot. 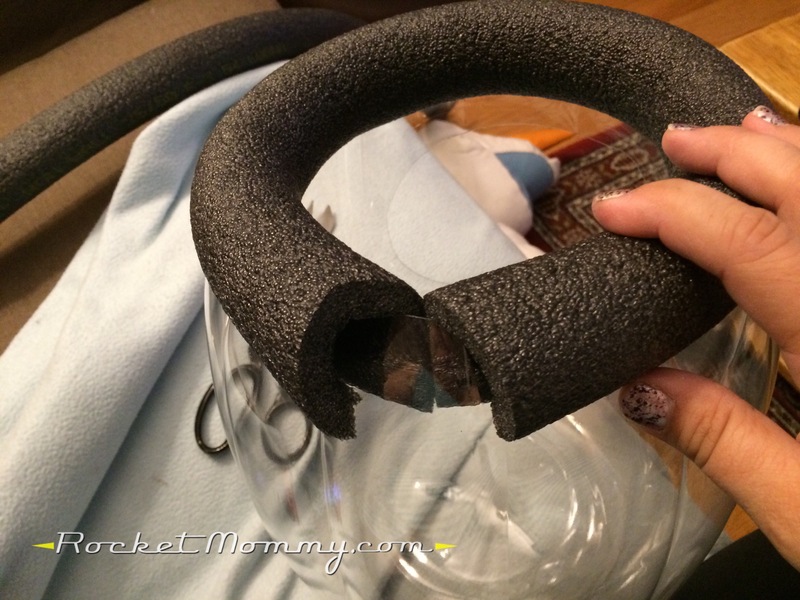 It’s intended to cover a 1/2″ diameter pipe, and it has a split down the side. Fit the insulation around the bottom edge of your helmet. When it’s time to cut the end to close it off in the back, be aware that if you cut it straight, it’s going to leave this wedge-shaped area that will need to be filled in. Now, I made THREE of these helmets, and each time I ended up with that damn wedge no matter what I did, so you may as well expect that it will happen to you too. So that’s annoying, but it’s fixable. You’ll have plenty of insulation left over because it comes in 6′ lengths, so chop a little piece and trim it to fit in the empty space, then hot glue it to the other foam pieces. 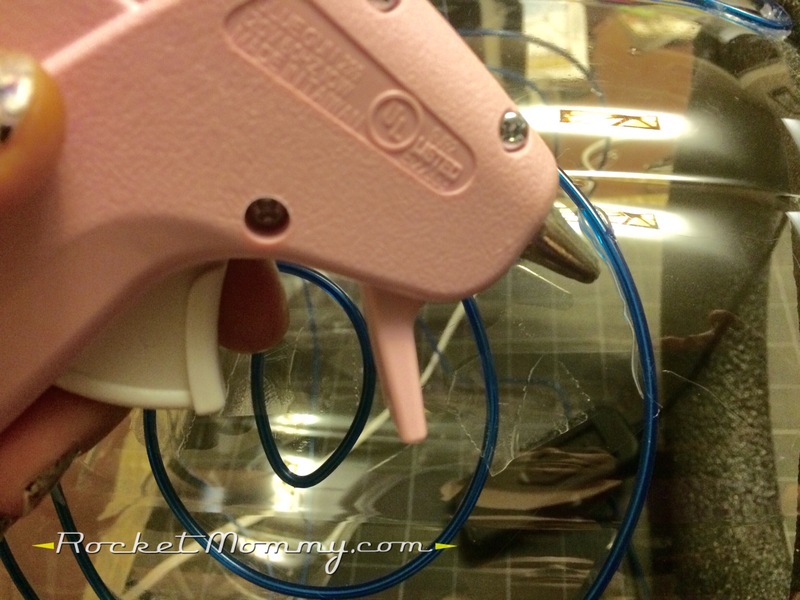 The foam freaks out a little with the heat of the glue and melts down a bit, so I recommend doing a very light coat of hot glue first to allow that first reaction to happen, let it cool, then goop it on and hold it together and make it stick. And if you make sure this part is at the back of the helmet, you won’t really see it anyway. And voila! 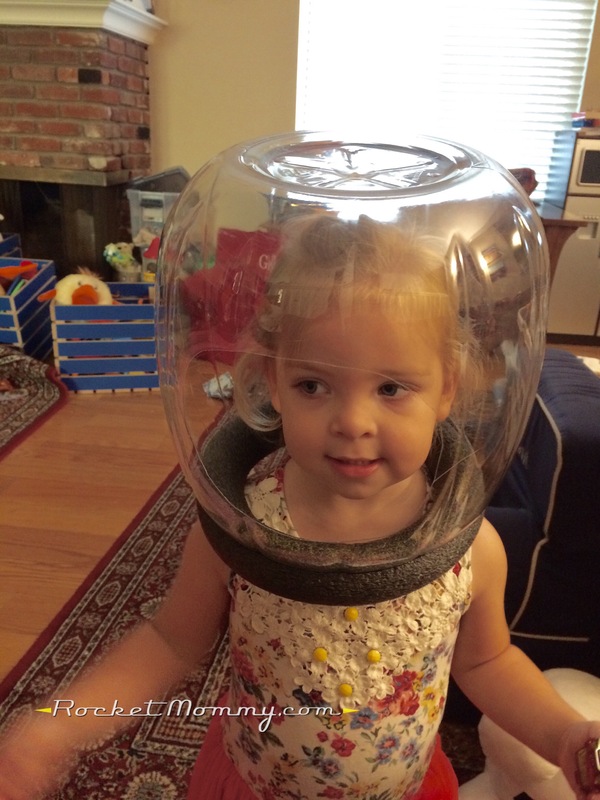 You have a cute little space helmet! Now, for most purposes you can just stop there. 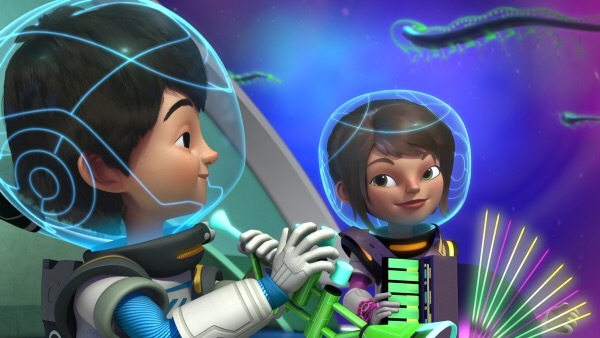 But we’re working on Miles From Tomorrowland costumes around here this month, right? And the Callisto family has some super cool helmets that I wanted to try and emulate. They have a Miles helmet that’s available online, but it looks really cloudy and unimpressive in the pictures, and I thought it would be infinitely cooler if we had helmets that lit up. Soooo…. I went ahead and bought some blue electroluminescent wire (or EL wire) to experiment with on these pretzel-bucket helmets. I got the 15′ length that I linked above, figuring I could always cut it down if I didn’t need that much, but it turned out to be just right. 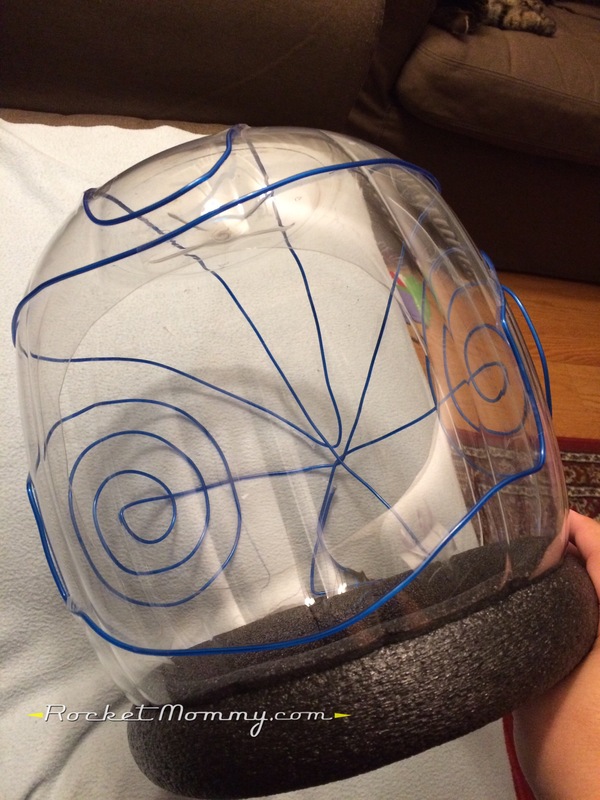 I laid out the design on the helmet and taped it in place temporarily with regular old Scotch tape. Then I tacked it down in as many crucial areas as I could with a hot glue gun, peeling the tape off as I went. Hot glue didn’t want to stick very well to the plastic helmet in all areas (for some reason it adhered fine in spots and didn’t in others), but it’s holding well enough to get us through Halloween, I think. The battery pack is dangling off the back right now, but I will attach it to the costumes with Velcro so the helmet can easily be removed if someone decides to have a fit over wearing it all evening (very likely, haha). It looks pretty darn neat, if I do say so myself! One item to really stump me! Thank you so much! This is great! Incredibly awesome and doable. And way better than spending almost $20 on junk plastic. THANK YOU! Hi there, do you roughly know the diameter of the container used for the helmet? 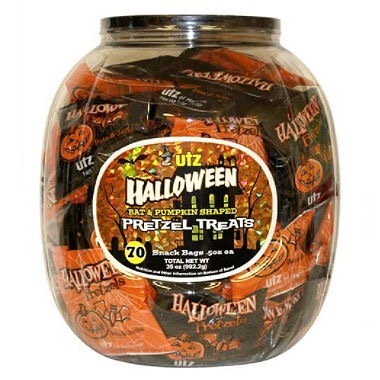 Living in Ireland and can’t source these Utz Halloween pretzel treats. Was thinking a plastic cocktail fish bowl thing might do the trick? Thanks in advance! I’m so sorry, I didn’t see this comment until just now! I just measured it, and it looks like it’s roughly 9.5″ in diameter at its widest point, and about 10″ tall.